Be the first to share your favorite memory, photo or story of Melinda . This memorial page is dedicated for family, friends and future generations to celebrate the life of their loved one. Mrs. Melinda Gale Milby Hall of Greensburg, Kentucky, daughter of the late Walter Randall Milby and Nancy Durrett Milby, was born on Friday, September 9, 1955 in Taylor County and departed this life on Wednesday, February 6, 2019 at the T.J. Samson Hospital in Glasgow. She was 63 years, 4 months, and 28 days of age. She had made a profession of faith in Christ, was a member of the Greensburg Cumberland Presbyterian Church where she served as past Elder, Crossroads Youth Program Supporter and former Coordinator; She was retired from the Taylor County Rural Electric Cooperative Corporation; a long-time member of the Green County Fair Board; a member of a special Bunco group for over 40 years; and was a member of the American Legion Ladies Auxiliary. She was preceded in death by her husband: Dennis Ray "Chopper" Hall on November 8, 2017 having united in marriage on February 6, 1981. Survivors include a daughter and son-in-law: Paige Nichole Hall Squires and Bubby Squires of Greensburg; two grandsons: Blayde Squires and Bryce Squires both of Greensburg; two sisters: Jan English and Terri Talbott both of Greensburg; a brother-in-law & sister-in-law: Terry Michael and Judy Hall of Greensburg; a brother-in-law: Brad Butterfield of Indiana; nieces and nephews: Randy English of Greensburg, Erin and Joel Eichenberger of New York, Rachel Butterfield, Mikayla Talbott both of Louisville, Callee Talbott of Greensburg; a great-niece: Madeline Eichenberger of New York; and a host of other relatives and friends. Melinda was also preceded in death by a sister: Cindy Milby Butterfield on May 29, 2015. 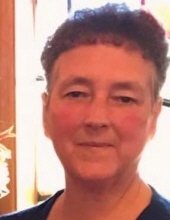 The funeral services for Mrs. Melinda Gale Milby Hall will be conducted at 12:00 Noon, Central Time, Saturday, February 9, 2019 at the Cowherd and Parrott Funeral Home with burial to follow in the Green County Memory Gardens. Bro. Freddie Norris and Bro. Matthew Ingram officiating. Visitation is requested from 4 P.M. until 8 P.M., Central Time Friday at the Cowherd and Parrott Funeral Home and after 7 A.M., Saturday until time of the funeral service. Memorials are suggested to the Greensburg Cumberland Presbyterian Church Crossroads Youth Program or Hosparus, which can be made at the funeral home. To plant a tree in memory of Melinda Gale Milby Hall, please visit our Tribute Store. "Email Address" would like to share the life celebration of Melinda Gale Milby Hall. Click on the "link" to go to share a favorite memory or leave a condolence message for the family.